Here we compare the standard perspective on labor productivity with that of ENL. This serves two purposes: it underscores the need for ENL to take an independent stance on the subject, and it introduces the elements that must be taken into account in ENL's technical treatment of labor productivity. 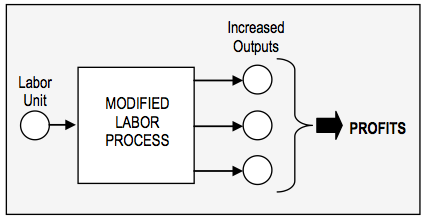 Assume that, for the current labor process in a production facility, one unit of labor results in two output units. The labor process is now modified so that productivity rises by 50%. This means that, under the new conditions, one labor unit produces three output units. For standard economics, which reflects the logic of capitalism, this situation would be perceived as shown in the following figure. A rise in productivity will result in a higher output quantity per labor unit. In general, this change will take place only if it increases profits. The first point to note is that standard economics sees labor exclusively as a means — that is, as an input to production. Therefore, the effects of the labor process modifications on the workers themselves, considered as human beings, are ignored. This is addressed in ENL's approach to cost, which distinguishes between opportunity cost and input cost, noting that only opportunity cost is part of standard thought. Second, the human consequences of any additional environmental damage that may accompany the new labor process are also ignored. In the coy language of standard economics, they are "externalized". Third, the criterion used to judge if labor productivity should be increased is whether or not this will increase profits. If it is more profitable to raise output quantity by increasing labor quantity instead of labor productivity, then additional workers will be hired, or existing workers will work longer or more intense hours. The ENL perspective on increased labor productivity is summarized in the following figure. As before, a rise in productivity will result in higher output quantity per unit of labor. From the ENL perspective, this change should take place only if it can increase overall health from potential value (PV), labor cost, and natural cost. The differences between the two perspectives are significant. First, ENL sees labor as both a means and an end. As a means it is an input to production, as in standard economics. As an end, however, labor is also a worker — that is, a human being. We must therefore determine how the modified labor process will affect this person's health. In ENL this is done through the concept of labor cost, which includes the effects of increased technological intensity. Second, the public health consequences of any incremental environmental damage are fully considered through natural cost rather than treated as externalities. 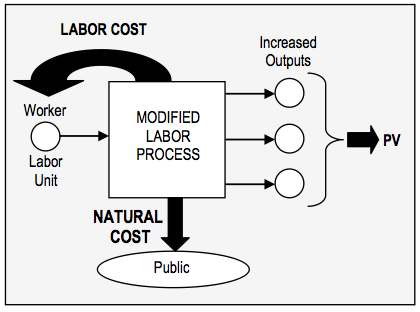 And third, the criterion for deciding if labor productivity should be increased is not profit, but rather the overall health consequences, taking into account the potential value from increased production, plus labor cost and natural cost. A brief digression: It should be obvious from the above comparison, if it is not obvious already, that ENL treats human beings with far more respect than does standard economics. However, as with almost everything of consequence in the social world, historical context must be considered. The perspective shown in the top figure reflects this simple, brutal logic. A more nuanced rationality, such as that offered by ENL, is required at this stage of history not only because the capitalist approach has become ecologically untenable, but also to correct the massive global injustices that these propensities have over time engendered. What is primarily subject to criticism is not the advent of capitalist logic several centuries ago, but the failure to replace this logic once its destructive human and natural consequences became apparent. 1. John Maynard Keynes, "Economic Possibilities for our Grandchildren" (1930), in Essays in Persuasion (New York: The Norton Library, 1963), 369.